stance p m being by hypothesis small (two or three radii of the planet suppose), it follows that the angle peq is extremely small, and may be neglected. Hence a planet will appear to be displaced from the position which it had when the light left it, just as a star in the same direction is displaced. 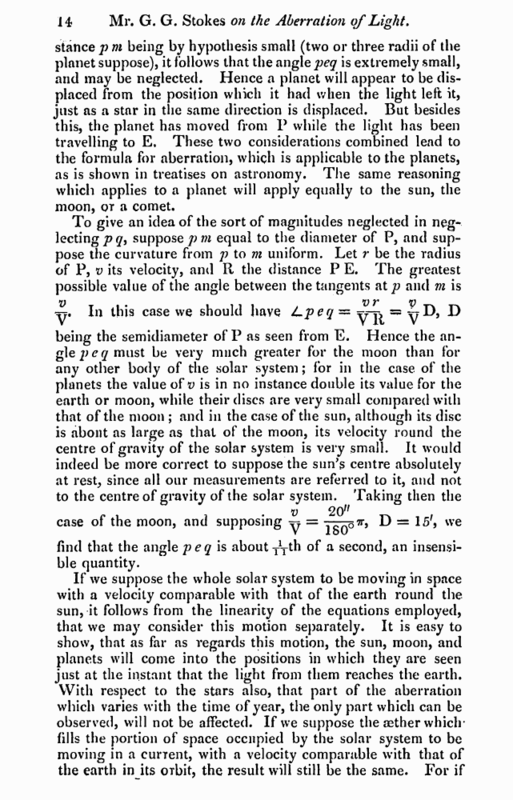 But besides this, the planet has moved from P while the light has been travelling to E, These two considerations combined lead to the formula for aberration, which is applicable to the planets, as is shown in treatises on astronomy. The same reasoning which applies to a planet will apply equally to the sun, the moon, or a comet. find that the angle peq is about yTth of a second, an insensible quantity. we suppose a velocity equal and opposite to that of the aetlte^ to be impressed, both on the aether and 011 the bodies of the solar system, the case is reduced to that of the solar system moving through the aether supposed to be at rest. IV. On the Structure of Electro-precipitated Metals. rr,HE following observations, being the result of an exten-sive series of experiments on the practical application of the processes of electro-metallurgy, will, I am induced to believe, be acceptable to the Chemical Society. The various appearances of the metallic deposit (ire familiar to all manipulators in electro-metallurgy, and are distinguished by the names crystalline, lesser crystalline, malleable, sandy and spongy ; the latter being produced by an excess of power in the battery, the first by too small a power in relation to the strength of the solution operated on. All these deposits are however merely modifications of each other, they are essentially crystalline, and even the malleable, or in other words the most cohesive, is very inferior.in strength to metals wrought by the processes in ordinary use. 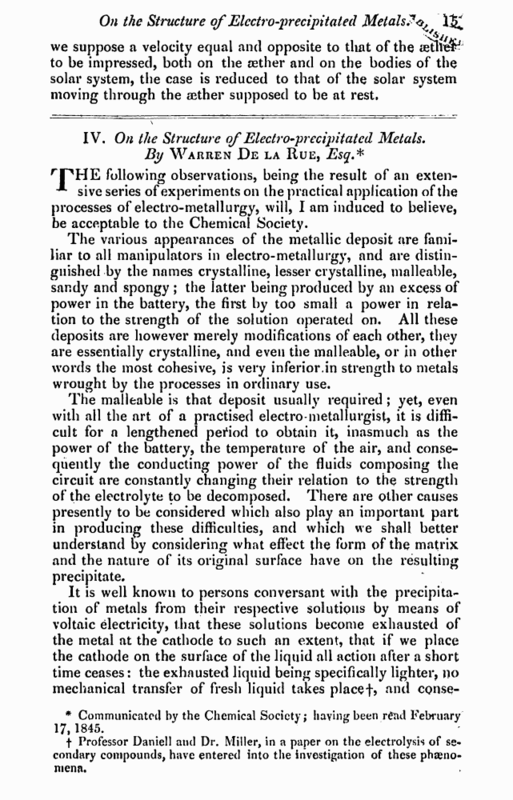 The malleable is that deposit usually required ; yet, even with all the art of a practised electro-metallurgist, it is difficult for a lengthened period to obtain it, inasmuch as the power of the battery, the temperature of the air, and consequently the conducting power of the fluids composing the circuit are constantly changing their relation to the strength of the electrolyte to be decomposed. There are other causes presently to be considered which also play an important part in producing these difficulties, and which we shall better understand by considering what effect the form of the matrix and the nature of its original surface have on the resulting precipitate. * Communicated by the Chemical Socicty; having been read February 17, 1845.
f Professor Daniell and Dr. Miller, in a paper on the electrolysis of secondary compounds, have entered into the investigation of these phenomena.